Submitted by Brittany Murphy on 05/06/2014 - 12:26pm. All Woburn census forms should be returned to city hall by Friday, May 9, advises City Clerk William Campbell. More than 16,000 forms were mailed to all households about two months ago. Under Massachusetts State law, if there is no record of receiving a census return, the city must mail a confirmation card to all voters. If you have not mailed your form back, please do so this week. Campbell adds “It will save you the inconvenience at the polls and will save the city money for additional printing and postage costs”. Submitted by Brittany Murphy on 03/11/2014 - 12:37pm. The deadline to avoid paying a late fee for dog licenses is Monday, March 17. 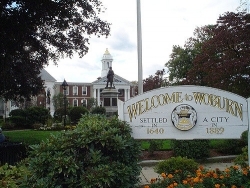 Woburn ordinances require that any dog over 3 months old must be registered with the City Clerk. The license fee for unaltered male or female dogs is $15. For spayed and neutered dogs the fee is $10. After March 17, the fee will increase to $30 and $25. Questions can be directed to the City Clerk's Office, 781-897-5850. Mail the attached form to the City Clerk's Office, Woburn City Hall Clerk, Woburn City Hall, 10 Common Street, Woburn, MA 01801.